If you’re like me, you spend a good portion of the day typing on your computer — whether it’s responding to emails, writing up papers, researching on the Internet, or just chatting with your friends through instant messenger. Typing, typing, typing. And eventually, typing can become a repetitive process. We can fix that. PhraseExpander Professional by Nagarsoft is available for $139.95 USD on Windows XP, Vista, 7, and 8. It’s available for both 32-bit and 64-bit versions of Windows. For you, however, we’ve got a great offer that you just can’t pass up: we’re giving away 25 copies of PhraseExpander Professional worth a total of $3,500 for FREE! PhraseExpander is a top-quality program that, unsurprisingly, expands your text — but at the same time, it’s so much more. I consider myself a computer addict, yet I’ve never seen a program like this. After only one week with PhraseExpander, my productivity has increased and I’ve saved a ton of time on typing. Keep reading to see how you too, can benefit from this awesome program! For the most part, PhraseExpander Professional is a program that sits in the background. Think of the way anti-virus software works: you install it, you fiddle with a few settings, then you rarely ever look at it again because it’s always running even when you don’t see it. That’s what PhraseExpander does, except instead of anti-virus, it does text expansion. The interface is much simpler than it may initially appear. PhraseExpander borrows from the Microsoft Office line of products with the ribbon interface. Fortunately, its layout is clean and there aren’t too many tabs, so you won’t end up feeling lost here. In the left panel, you’ve got a list of Glossaries, which are different groups of these text expansion indexes that you can enable or disable depending on when you need them. In the middle and right panel, you can define the indexes: a shortcut phrase that you type, and the full phrase that it expands into. So what is text expansion, anyway? It’s a simple concept with some powerful uses. Let me explain. Take the example of responding to emails. If you work as customer service, then you may end up typing a phrase like “Have a good day!” a million times per day. With PhraseExpander, you could set up a shortcut like hagd and that’s all you would have to type — the program would automatically expand the phrase for you. You can think of it like using Internet acronyms (e.g., lol) but having those acronyms automatically expand into their full phrases. That’s the basic concept, and you can probably see how useful that could be in day-to-day life. But PhraseExpander has a number of advanced features that elevate it from “useful” to “awesome” territory. PhraseExpander works in any program. If you can type, you can expand. When it comes to the phrases you can create, however, you have a lot of customization available to you. Not only can you expand into basic text, but you can also use these shortcuts to open specific folders, run certain programs, visit a URL, and more. So the next time you want to check your email, all you need a phrase titled gmail that’s set to open the gmail.com URL and you can instantly open up a Gmail tab–even if your browser isn’t open yet! Forget about simple text expansion. With PhraseExpander, you can do some complex operations that will blow your mind out of the water. For instance, how about dynamic website URLs? In one of the default phrase expansions, you can type goo to bring up an input box. Whatever you type into that box will be used to build a dynamic URL. You can use this to build dynamic phrase expansions, too. SmartComplete. A real-time list of suggestions will pop up as you type, showing you all of the possible phrase expansions. You won’t have to memorize anything, even if you have a ton of glossaries. Formatted text. PhraseExpander can expand into plain-text, but it can also do formatted text. It can do font formatting, text colors, paragraphing, alignment, and more. Text transformation. Set up shortcuts and hotkeys that not only expand text but transform it. With a single keypress, turn a fully capitalized sentence into lowercase, for example. Clipboard history. PhraseExpander saves the last strings of text that were saved to your clipboard, allowing you to browse through all of them. Macros. Built-in macros can help you perform powerful operations. Performance report. PhraseExpander has a built-in performance analyzer that will tell you how many commands you’ve executed, how many phrases you’ve expanded, and how much time you’ve ultimately saved. Now, all of these text-expanding features may sound cool, but is it a gimmick? Will it really save on time and effort? Honestly, it depends. If you aren’t interfacing with a computer for hours and hours every day, the savings will be real but they may not matter. On the other hand, if you write a lot of emails and type a lot of papers, you could earn yourself a lot of extra time. Look at the first row in the chart above. Assuming a typing speed of 60 words per minute (1 word per second), you can save up to 20 seconds with the ys shortcut. Considering a generous estimate of 50 emails per day, that’s 1,000 seconds. Combine that with dozens of other often-repeated phrases, like repl24, furth, mail, and you could be saving up to 5,900 seconds or 98 minutes per day. Again, we’re giving away 25 free copies to all of our loyal and beloved MakeUseOf fans and readers. Please remember that PhraseExpander Professional only runs on Windows XP, Vista, 7, and 8. 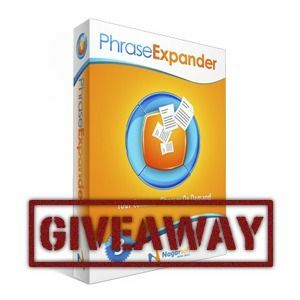 How can I win a copy of PhraseExpander Professional? Congratulations! If you were selected as a winner, you will receive your license via email in 3-5 days. If you require any assistance, please get in touch with Associate Editor Jackson Chung before Jan 7. Enquires beyond this date will not be entertained. This giveaway begins now and ends Friday, December 14th. The winners will be selected at random and informed via email. Yea, i won....thank you MUO, now i just might need a little help installing its frustrating too be a "newbie" however i say this with all sincererity your peeps have always come tnrough for me. I won! Thanks for this opportunity. seems like a hell of an useful time saver! Thanks for the giveaways! They are cool! Does anyone win these things? Nice. Pretty even. But I'll stick with Asutype. Thanks make use of For this giveaway. Also: for those who've used this, do you find yourself forgetting to use it? I can imagine myself half-way through typing a phrase and remembering that I'd set up the Expander to deal with it, and then deleting what I'd typed and re-doing it with this tool. A net-zero gain/loss at best in the time-saving category, and probably a time-waster. That's probably the most "difficult" part of PhraseExpander: remembering to use it. I'd say that after a week of using it (make sure it auto-starts when Windows starts up), you'll have no trouble remembering. Will be helpful if anyone besides Make Use of Employees win this. I'm wondering: what's the learning curve? How long does it take to develop and assimilate the new "code" for the phraseology? The speed of assimilation for PhraseExpander isn't very long. It depends on your own tendencies, but I'd say give it a week or two of daily use and it'll become second nature. For the verbose among us this is ideal! I could use a Mac version of this. it looks wonderful!!! love it!! I believe Word Expander is the clone, but they do look quite similar. All that's left is to compare the features and see if it really suffices as a freeware alternative! Will you be making such comparison? I've been looking for exactly such a freeware program. I would like to but my schedule is a bit clogged for a while. It's free so you could always give it a try yourself and see if you like it! I could really use a program like this!! Could be very useful, thanks! This program looks useful. It would be better if it had an adaptive algorithm though. The program should run in the background for a week and then show you your most often used phrases. Set-up this way would be much easier than manually creating shortcuts. It would be great if the program worked in games. There are around 20 phrases I use often while gaming. Some of them are long and require precious time that I don't have to type out. Just a suggestion to make this program even more awesome. I like PhraseExpander's layout. The ribbon style is very familiar and easy to use. The price is a bit out of range for the average productivity worker though. I don't know if this program is targeted towards corporations, but as a personal user, I would not be able to afford the purchase price. An adaptive algorithm would be useful indeed. PhraseExpander will work in some games depending on how they interface with the operating system. Whether or not it works for a specific game will have to be tested independently.